Taste test: We've got several dedicated hot chip fans around the chip bowl, so usually when we're sampling hot chips, there's no shortage of critics to say the chips are just not hot enough, or even not hot at all. Smell test: Slightly spicy smell, no real heat to it. 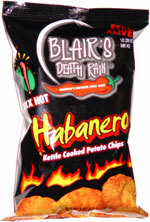 From the package: “America's favorite spicy chips!” ... “Ingredients: Select potatoes, sunflower oil and/or high oleic monounsaturated sunflower oil and/or cottonseed oil and/or corn oil and/or soybean oil, dehydrated can juice, salt, paprika, garlic powder, spices, natural smoke flavors, habanero.